Nindra(Standing) Nambi, Kidanda(sayana) Nambi and Erundha (sitting) Nambi all are at one place. Erundha Nambi is on the banks of the Tirupparkadal rivulet about 1/2 km from this temple. The Malaimel Nambi is on the hill about 10 kms form here. About a km from the village is Tiruparivattai Parai(Rock) on which there is a Sannadhi for Bhagwat Ramanuja. It is believed that Lord in the name of Vaduga Nambi saved Bhagwat Ramanuja from enemies who planned to kill him. In Ramanuja's Sannadhi, the Lord stands in the form of his Shishya and hence known as Vaishnava Nambi. The Varaha Purana describes the story of a great devotee, Nampaduvan, who helped a Braha Rakshash in absolving his curse and attain Moksha. This is dramatized every year on Kaisika (Karthikai) Dwadashi. Theertham - Tirupaarkadal, Panchaturai, Sindu river. The Moolvar of this Divyadesam is Nindra Nambi. Also called as Kurungudi Nambi, Irundha Nambi, Kidantha Nambi, Vaishnava Nambi, Thiruppaarkadal Nambi and Malaimel Nambi. Moolavar in Nindra Thirukkolam giving his seva and facing his thirumugam in east direction. 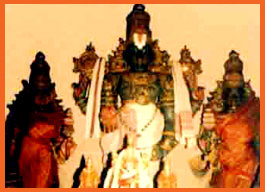 Prathyaksham for Lord Shivan. This sthalam is situated in Tirunelveli district in Tamil Nadu. We have travel through Tirunelveli, Naanguneri (Cheeri varamangai) and panakudi when travellin through bus. There is no lodging facility.